Cropped for use in the CM 7-16-7. Missionary wives at field cf. at Loon Straits. L. to R.: Mrs. H. J. Gerbrandt, wife of sec. 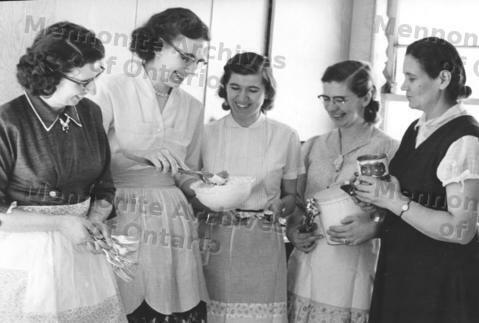 ; (Mrs. Henry) Elna Neufeld, Mrs. Ed C. Brandt, Mrs. Otto Hamm, Mrs. J. M. Unrau. Negative for photo and 2 additonal similar negs.